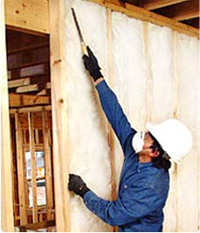 From new condo construction in Columbia to retrofitting an office building in Birmingham and much more, Arango Insulation has the economical and efficient Johns Manville insulation to meet and even exceed your requirements for virtually any commercial insulation installation. Serving the metro Atlanta, Georgia area from our Fayetteville location, Arango Insulation offers Johns Manville products throughout the states of Pennsylvania, Maryland, Virginia, North Carolina, South Carolina, Alabama, Florida, Louisiana, and Texas. We also carry Johns Manville wrap for new construction. Call or e-mail Arango Insulation today for more information on all our Johns Manville insulation products and our installation services for both retrofit and new construction jobs. We offer extremely fast turnaround times and competitive pricing to get your job done on time, every time, while staying within budget.